When America wants to learn how to make the perfect pie crust, plant an herb garden or fix a broken windowpane, it turns to Martha Stewart. Through the award winning magazine Martha Stewart Living, an Emmy Award winning television show, a Web site, syndicated newspaper columns, national radio show, mail-order catalog and product lines, Martha shares the creative principles and practical ideas that have made her America’s most trusted guide to stylish living. Inspiration surrounded Martha at an early age. Raised in Nutley, N.J., in a family with six children, Martha developed her passion for cooking, gardening and homekeeping in her childhood home on Elm Place. Her mother, a schoolteacher and homemaker, taught her the basics of cooking, baking, canning and sewing, and her father, a pharmaceutical salesman and avid gardener, introduced her to gardening at the age of 3 in the family’s small but orderly backyard garden. While earning a bachelor’s degree in history and architectural history at Barnard College, Martha worked as a model to pay her tuition. She got married during her sophomore year, and upon graduating became a successful stockbroker on Wall Street, where she gained her early business training. After moving to Westport, Conn., with her husband and daughter, Alexis, in 1972, she developed a catering business that showcased her remarkable talent and originality. Her unique visual presentation of food and the elegant recipes she created for her catered events were the basis for her first book, Entertaining (Crown, 1982), which has become an American classic. 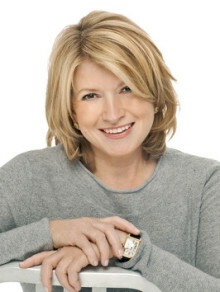 Martha Stewart was named one of the “50 Most Powerful Women” by Fortune magazine in October 1998, as well as one of “America’s 25 Most Influential People” by Time magazine in June 1996. She has earned two Emmy Awards for “Outstanding Service Show Host” (for the 1994-95 and 1996-97 broadcast seasons), and Martha Stewart Living earned an Emmy for “Outstanding Service Show” for the 1998-99 season. Martha Stewart Living has been honored with numerous awards, including three National Magazine Awards, more than 50 Society of Publication Designers Awards, and the Acres of Diamonds Awards for Magazine Development. Do you want to hire Martha Stewart? Directly request a quote. In 48 hours we can send you the availability of Martha Stewart If you would like to book Martha Stewart, Entertainment Booking Agency is the right place. We will offer you the best price and contact the management or we directly contact Martha Stewart. For corporate appearances or speaking engagements you can contact our agents and the will help you true the process. Tags: hire Martha Stewart, Martha Stewart booking, book Martha Stewart, Martha Stewart appearances, find more information on booking Martha Stewart for appearances, Martha Stewart speaking engagements, Martha Stewart endorsements/spokesperson, Martha Stewart appearance fees, Martha Stewart booking agency contact info, biography of Martha Stewart, Contact an artist booking talent agent find a speakers bureau that can book Martha Stewart, speaker booking agency for Martha Stewart, Martha Stewart booking agency, Martha Stewart booking for corporate event. EBA is one of the biggest entertainment booking agencies in the World. We book hundreds of celebrities, artist, athletes and speakers in a year. Important to know is that we are not claiming to be the management of Martha Stewart. We are not the official agent for Martha Stewart. Companies from around the globe book these artists and speakers true our company be course we have one of the biggest networks and we always have direct contact with the artist or the management. We help you to find the right celebrities for your corporate of private events. Please contact one of our agents to get free advice and we will help to get the world-famous artist on your party.